Philanthropic shepherd in charge of Champions Royal Assembly, Bro Joshua Iginla has put a significant smile on the face of another poor widow in far away Botswana on Thursday , December 1st, 2016. Mariam Olebeng, a widow for 11 years, resides at Plot 16648, Naoni Street, gaborone West, Botswana. 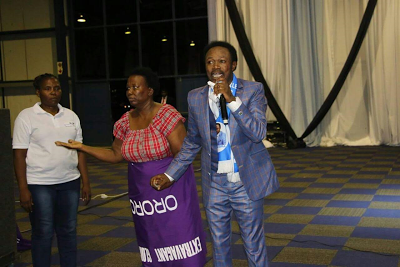 The man with a large heart touched the widow's life during the Botswana prophetic invasion which began same day. During the prophetic service , he picked her out by prophecy and revealed to her the darkest issues. The shocked woman was dumbfounded and she got the greatest surprise when he dashed her a 1000 dollar ($1000) on the spot. Not done yet, he also gave her son, Prince Olebeng an automatic scholarship to any level of his educational desire. Aside that, he was also magnanimous enough to give her his direct access any time she needs help. In his words, giving is in our DNA, like my master master God... and no matter what people Say, we can't stop touching lives unconditionally. Why? Because the greatest of all is Love.